All transactions are safe and secure with a reliable history in online purchasing behind each of our associates. Buy the Freddy Krueger Screamworks t-shirt to own Nightmare on Elm Street clothing and merchandise. This Freddy Krueger t-shirt features the A Nightmare on Elm Street character incorporated into the Dreamworks studio logo. Wear it to watch your favorite, including Freddy's Dead: The Final Nightmare featuring Robert Englund as the infamous nightmare murderer. For a mind-blowing Halloween, check out the male and female Freddy Krueger costumes in the gallery and browse the props and merchandise that go with them. 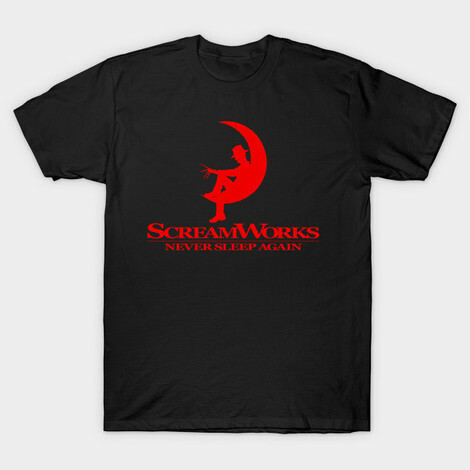 In addition to the Freddy Krueger Screamworks tee above, browse the Nightmare on Elm Street Clothing Gallery for more apparel like men's and women's clothes, kids shirts or hoodies.